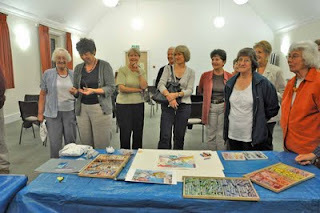 I had a fantastic evening with the Bury Art Society last night. 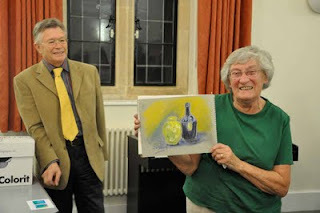 They had invited me to do a pastel demonstration three years ago and what with my injured hand and chaotic schedule, not to mention a bit of fear and trepidation, it wasn't until last night that I was actually able to do it. I'm not sure how many people attended, but I would say there were more than 30 and I'm not sure what they expected, but I am quite sure they got something rather different. I love the way life converges. My job, Eastfeast, has taught me that if one begins from who he or she is and does things in a way that feels right then everyone is much more comfortable. I approached the evening with that in mind and began with Cranberry Island, a little island off the coast of Maine where wonderful artists have inspired me and guided me to see and interpret. I thought that my otherness would be interesting. From the response, it seems it was. Although hired to give a demo, I again decided to begin where I feel most comfortable, as a facilitator, rather than an expert. My talk headed in that direction, while giving people some of the tools for developing their own process. 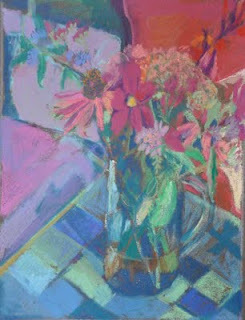 I was heartened by the enthusiastic way the members of the society experimented with pastels and monotype. Thank you all, and lets hope a few of you discover the blog! On Wednesday I will be giving a demonstration for the Bury Art Society. It will be a combination of slideshow, demo and hands on activities for participants. In preparation, I have been trying to consider my own process so that I can say or do something useful. The problem is every time I begin a new drawing, I feel as if I don't know what I'm doing, that I have no process. This week has been about pushing myself in lots of different directions and then just drawing. This is the final result. You can tell that Nancy Delouis is in my head.